Mötley Crüe are excited to announce that Tommy Lee will be bringing his mind blowing 360 degree drum roller-coaster to the UK for their December co-headline tour with Def Leppard! The wonders of the wheel will be spectacularly unveiled during Tommy Lee's thrilling drum solo where he is launched into multiple loops and pyrotechnics while continuing to perform. Not one to keep the fun to himself, the drummer also hand picks a fan from the audience to join him for his crazy ride at every show. Daredevil, Tommy Lee says "This idea came about from when I was a kid going to concerts. Whenever the drummer started his drum solo, I wondered why people would leave to go get a beer, buy a t-shirt, restroom, whatever!! I wanted to show people what happens behind the drum set, so I decided to expose it all by flipping the drums vertical, upside-down making them disappear and fly over the audiences heads! 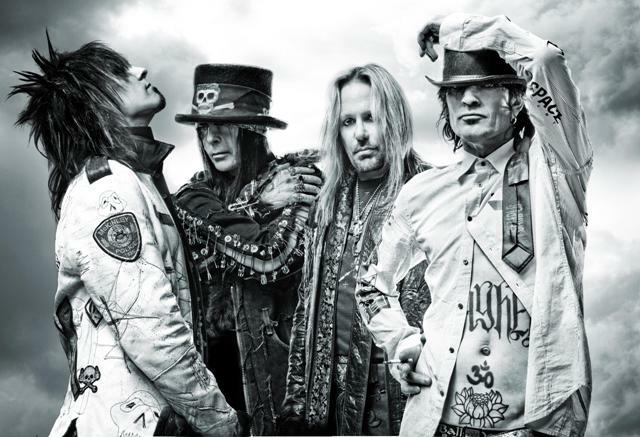 Mötley Crüe brings you on a thrill ride, jump on the 360! Let's do this! By the way, it's really f*****g difficult playing while on this ride!" Tickets are on sale now priced at £47.50 London / £45.00 regionally (subject to booking fee) via www.livenation.co.uk. Mötley Crüe are also about to re-issue their core catalogue on CD and vinyl after a long absence in the market place. The following albums will be re-released as limited edition Vinyl replica CDs with a 16 page booklet, regular CD’s with a 5 page booklet and on 180g vinyl in a 4 colour Gatefold sleeve: ‘Too Fast For Love’, ‘Shout At The Devil’, ‘Theatre of Pain’, ‘Girls Girls Girls’ and ‘Dr Feelgood’. They will be available November 14, 2011 on Eleven Seven Music. This will be followed by ‘Motley Crue’s Greatest Hits’ package in CD, Deluxe (CD with DVD) and 180g Vinyl formats on December 5, 2011.